It was one of those days, trying to get everything done before leaving for a week of vacation. I had not checked into our family text group or Facebook all day. When I finally opened the texts, there they were – my kids waiting for their mom, the family Rabbi, to offer an opinion. The family discussion was mostly a furious-paced posting and re-posting of various statements that had been published by my colleagues throughout the day. So I read many of the opinions all at the same time. The idea that struck me first was how proud I am to be a rabbi. As I read the comments and opinions, I observed that rabbis ask more questions than offer absolute answers. 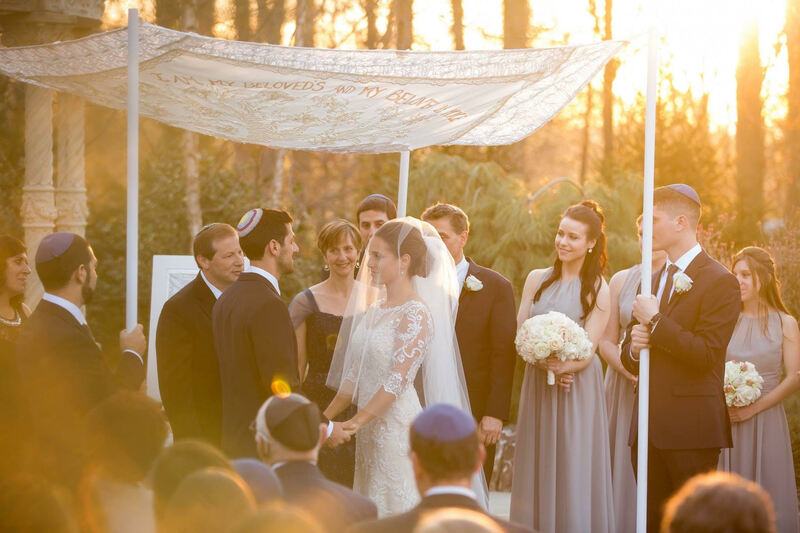 For the most part, rabbis advocating officiating at interfaith weddings and those opposed wrote with thoughtful consideration and respect for each other. In the modern day pages of Talmud that we call Facebook, I did not see very much disparagement or lack of respect (though I did certainly read some of that). The same cannot be said about the pages of our esteemed Talmud! Dad and I are grateful for and proud of the people you have chosen, and are choosing, to spend your lives with. You have fallen in love with good people whose core values match your own. And you have all chosen Jewish people as your partners. We do not take these facts for granted. I do not say that I am grateful for your choosing Jewish partners out of prejudice or closed mindedness. I do not say that I am proud as if somehow your parents did all the right things that led you to choosing these people. Many people raise their children just as we raised you and not all of them choose to marry or partner with Jewish people. Falling in love is a very personal matter. I could never take credit. The four of you have taken the foundation we provided and moved forward in your own ways. Still I am grateful and proud. Judaism is a particularistic religion in a world that seems to prefer universal open-mindedness. Being counter-cultural is not easy. It leaves one open to criticism of backwardness, naïveté or bigotry. But as you, my children, have heard me say since you were very young: Judaism is a very long chain and I do not want to be the one to break it. I love my children more than anything in the world. If you had chosen (or choose one day in the future) a non-Jewish partner, neither I nor your Rabbi, Craig Scheff, will officiate under a chuppah with you. The blessings recited and the ritual enacted there contain holiness when they are completed by two people who share the same covenant with God. It is my obligation as a rabbi and also as a Jewish mother to draw the lines of distinction even when they are painful. And yet I think you know, that if you chose a non-Jewish spouse, I would welcome that person into our family circle and teach him or her to love and respect Judaism. I would hope that with family and community influence, your future home would be a Jewish one. I know that is not easy, but I have seen many examples in my synagogue of non-Jewish partners supporting a Jewish family. As the texts were buzzing yesterday on my unattended phone, one of the many things I was busy with was taking photographs with a bat mitzvah and her family – her Jewish mom and her non-Jewish dad. I have been attached to this family since the bat mizvah girl’s naming, seeing them through her older brother’s bar mitzvah, the funeral of her grandfather and her own bat mitzvah studies. Her non-Jewish father calls me his rabbi and I consider him my congregant. She said that because she knows how much I respect and cherish her family. But as I thought about it last night, she was not actually correct. As a person and as a rabbi, I cannot officiate at a Jewish wedding ceremony if both people are not Jewish. I do not think that I will change my mind even if some rabbis of the Rabbinical Assembly move toward officiating at some kind of interfaith wedding ceremony. My job as a rabbi is to build relationship. It is also to protect a sacred obligation to the holiness of my particular religion. I know that it is possible to be a rabbi to interfaith families, to welcome interfaith couples and to raise their children as Jewish in my synagogue community. I am willing to continue asking questions and hearing the stories of real people. That is my calling. A wedding is a sacred moment in time, but a marriage is for a lifetime. As a rabbi, in relationships where one partner is not Jewish, I won’t be under the chuppah, but I will be there for the marriage. Rabbi Henry Sosland came to the New City Jewish Center in 1958 straight out of the Jewish Theological Seminary. 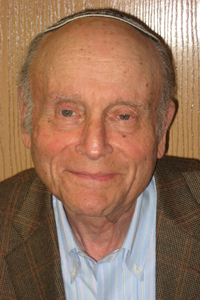 In 2005, after 47 years serving the community, Rabbi Sosland retired to emeritus status. Visiting him this past week with my father, I was reminded of his gentle manner, his amazing recall for names, and the subtle ways in which he empowered, encouraged, inspired and taught me. People tend to mention his name softly, with deep veneration, respect and fondness. I am blessed to call him my rabbi and teacher, and I hope my chosen path has brought him a measure of pride and nachas. 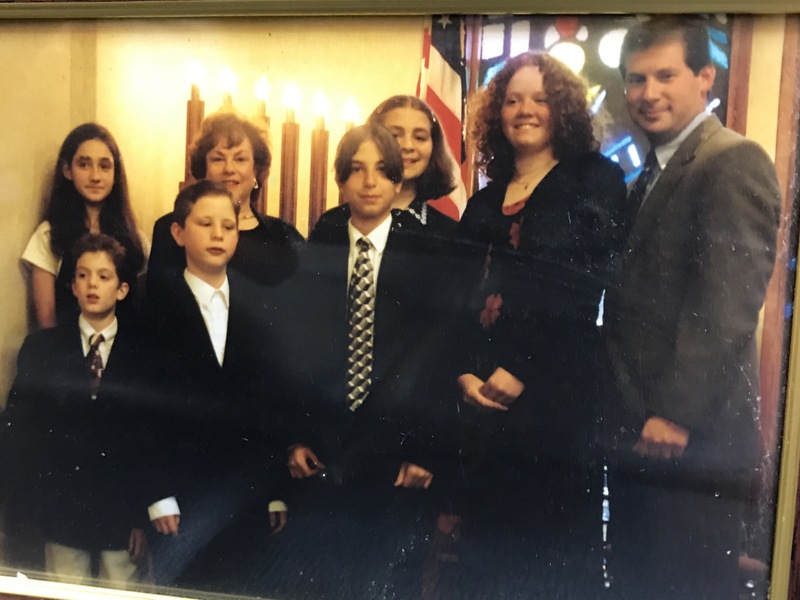 When I entered rabbinical school in 1992, one of my main personal and professional goals was to find the kind of community upon ordination in which I would want to settle down, raise a family, build a career, and retire after 40 years of service. What I could not anticipate then was the great contentment, satisfaction and perspective that would come with sharing with families the cycles of life, from births to death, with so many celebrations in between; the great anticipation of standing under a chuppah for a bride I named when she was a baby; the sadness that would accompany the many losses I have felt so personally yet often carried so privately; the deep familiarity and connection I would enjoy with individuals and families; the pride I would derive from a community that strives to learn, grow, raise the bar for itself and others, and constantly take on new initiatives and challenges while preserving the tradition at our core; the joy upon hearing that one of my students had chosen for himself a career in the rabbinate (thanks, Ben!). Last night, our OJC community approved the terms of a new contract that will extend my tenure here to 2030. I am so grateful to this community for its professional and personal trust and support, for the mutual respect and love we share. God willing, we’ll reach that year as a community in good health; I’ll be 65, I’ll have served the synagogue 35 years, with my goal of 40 years in the same pulpit in sight. Our Talmud teaches that one who has taught Torah to another is credited with having given them life. That renders the teacher a spiritual parent. 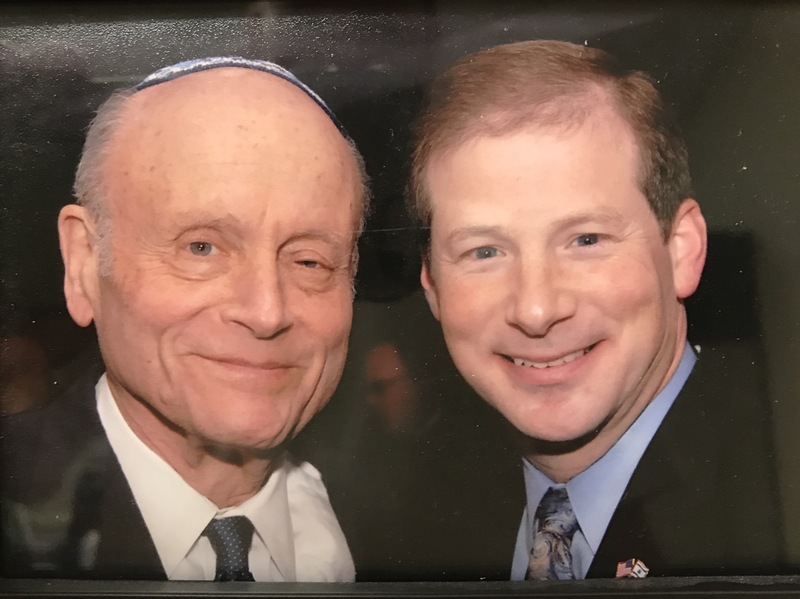 So as Father’s Day approaches, I thank all my teachers–my “spiritual parents”–but especially Rabbi Sosland, for sharing his Torah, for inspiring me to follow in his path. And I pray that I will have the privilege to be considered spiritual parent to many students of Torah in my lifetime.